With Spring starting to get under way in Florida, I thought it was a good morning to check in on the Turkey Creek Sanctuary and see what was going on. Bird migration is still some weeks away, so I wasn’t expecting an influx of warblers or anything. The morning started off a little cool and foggy in spots. 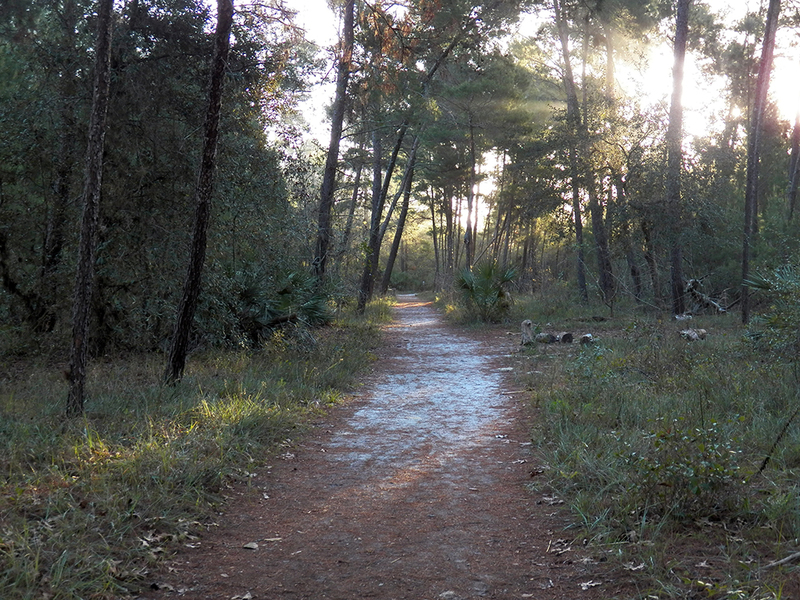 Here’s the view from the Sand Pine Trail as the Sun was burning off some mist. Plenty of sand, pines and it’s a trail! The first birds I heard after getting on the trail were Northern Cardinals and Carolina Wrens. 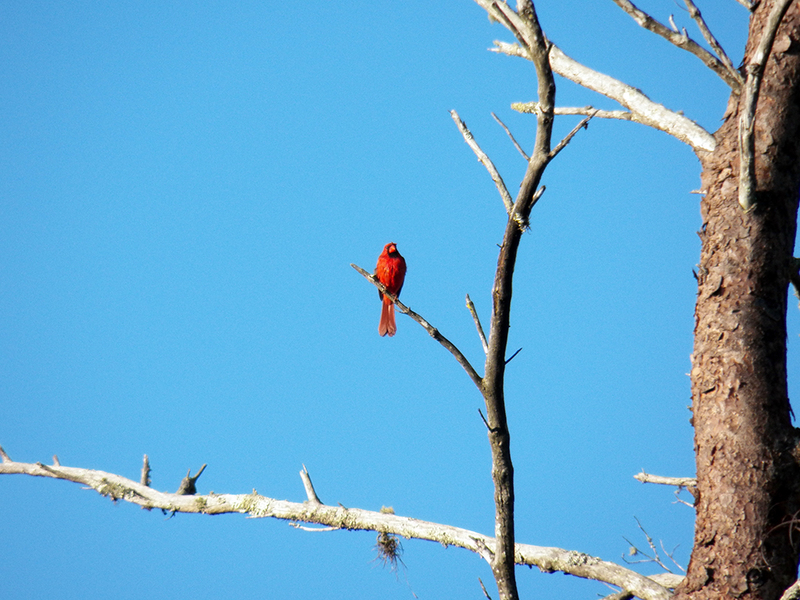 These species are usually the staple of Turkey Creek Sanctuary, though as I’ve previously discussed, the cardinals have been down in numbers of late. There was a pretty strong contingent this particular morning, though. It amazes me how well hidden Northern Cardinals can be, given how brightly colored they are, but both the males and females tend to stay low in the brush, occasionally popping up into a pine tree. When one does venture into the open, even a far way off, it’s unmistakable. Throughout the sanctuary the Winter and year-round residents were active and vocal, as the longer days help gear them up for the Spring. 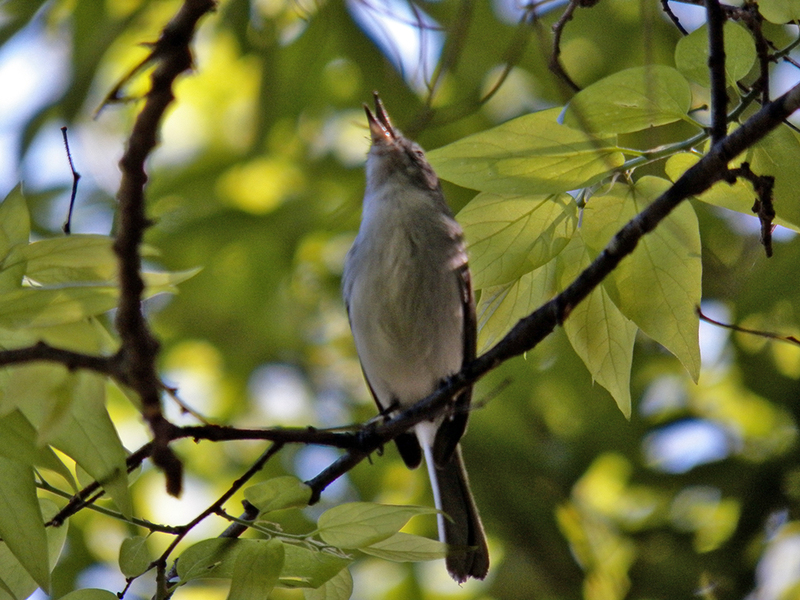 A large number of the Blue-gray Gnatcatchers were singing their soft, bubbly songs in between bouts of their nasal call-notes. A Blue-gray Gnatcatcher in “full song.” This is probably the longest I’ve seen one hold still (a total of about 15 seconds!). Commonly, other birds (like vireos or warblers) associate with gnatcatchers, so I paid close attention to any other movements in the canopy. I had heard Northern Parulas singing, so I knew they were around. 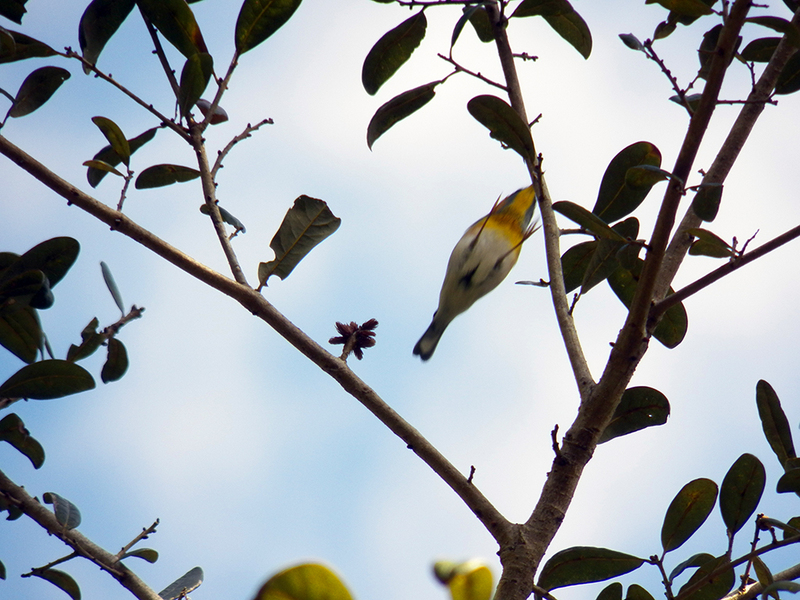 The Northern Parulas that I saw were quite active and in either the canopy or the thick brush. There were males, already with their breeding colors, and females foraging. Things were really hopping at the Sanctuary! Deciduous trees in Florida do lose their leave every Autumn, though there’s no real period with bright red and gold colors like there is further north. By February they are beginning to leaf-out, and by the time the migrant songbirds start arriving in March, there’s plenty of canopy for them to hide in. It’s easy being green. For a tree. The understory and ground cover has been growing in as well. Ferns figure in fairly prominently in the habitats adjacent to Turkey Creek. Away from dumpsters and trashcans, raccoons forage on the forest floor looking for bugs, nuts and anything else edible. This raccoon was intently watching something for several minutes. After a while, it went back to digging in the ferns for food. 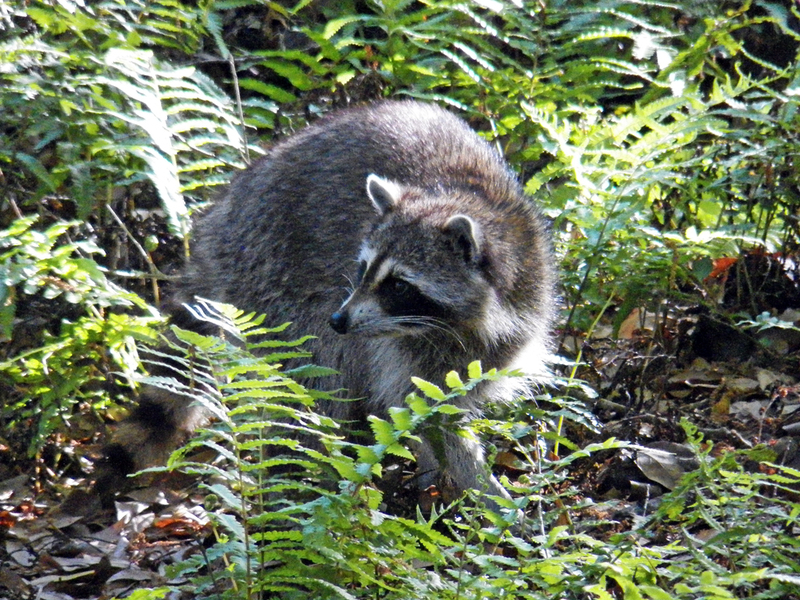 Racoons are perhaps an ultimate victim of human development. They are intelligent and highly adaptable, which has made them pests in some places, as they scavenge for food and find places to live that don’t always agree with human settlement. But that adaptability has made them survivors, (despite us infecting their population with rabies) and we should at least admire them for that while taking humane measures to keep them out of harms (peoples’) way. Butterflies have been an almost constant all Winter where I’ve looked, and this day was no exception. The majority of the species I saw this time were the Zebra Longwings, which are Florida’s official state butterflies. Here, you can see where they get their name. I walked out to the canal and weir, and there was a small collection of herons nearby, as well as some Mottled Ducks. This drake was standing alone on the edge of the canal, his bright yellow bill and recently refreshed plumage should make him a striking figure and a good catch for the lady-ducks! 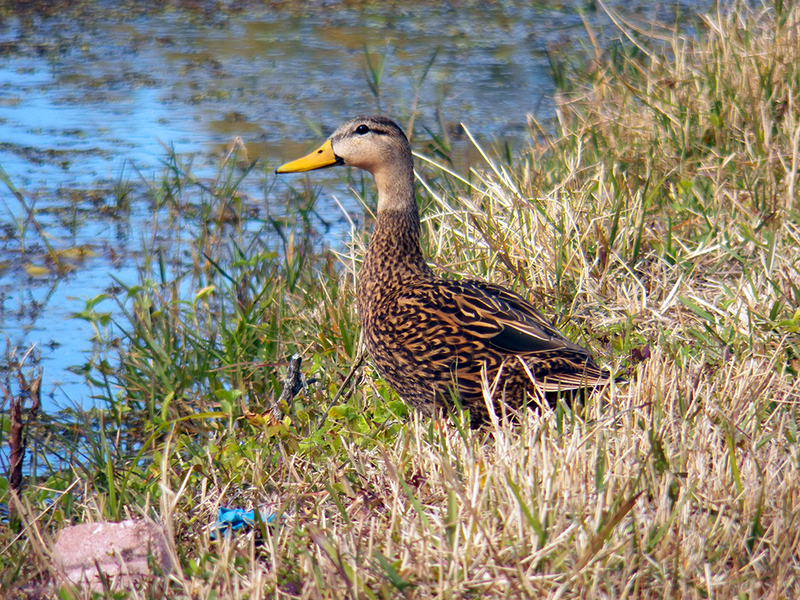 Mottled Ducks nest from February until Summer, and most are already paired up, but there’s still time for this guy to find a mate. Back in the Sanctuary, as the morning progressed, more birds were foraging in the middle layers of the woods, including White-eyed Vireos and some warblers. Soon, more vireo species will be moving in, as the wintering Blue-headed Vireos move out. 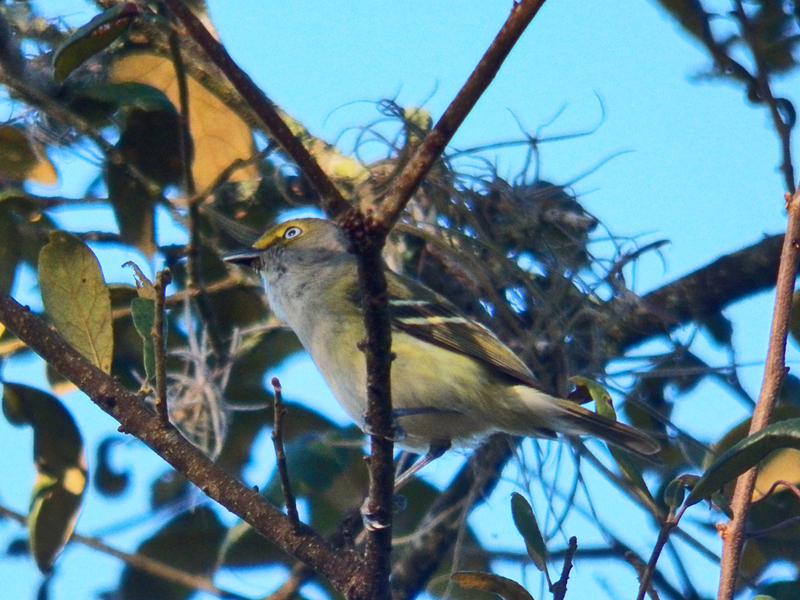 White-eyed Vireos are resident all year, though. Most passerine birds have black eyes, and a few have red eyes. In Florida, two have white irises: the White-eyed Vireo, and the Eastern Towhee. 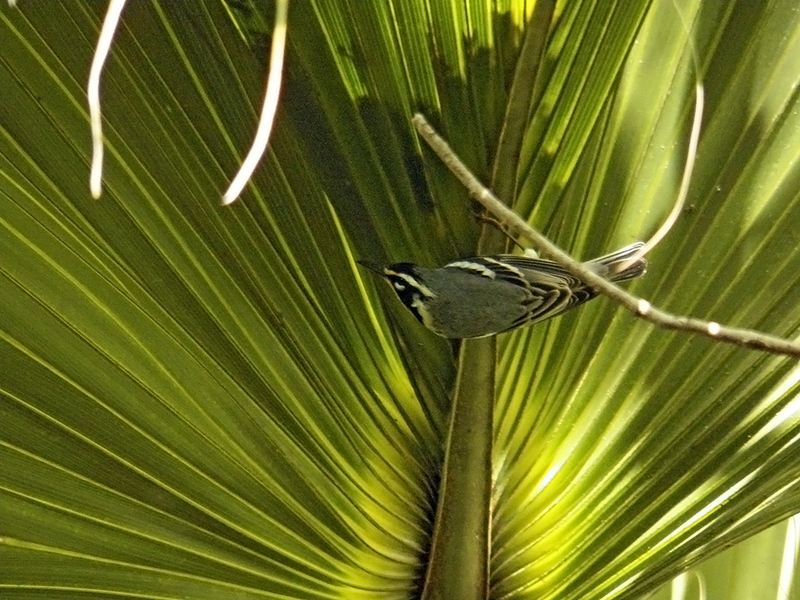 Black-and-white warblers are also Winter residents in Florida, and the time of year just before migration finds them gleaning bugs from tree bark as they prepare to fly north. They tend to be a little less shy, too. You can find them associating with vireos and Blue-gray Gnatcatchers, as I did. I couldn’t remember what their song was like, and had intended to quietly play it on my phone, but had the volume up louder than I expected. This resulted in this bird flying down to eye level to scold me. 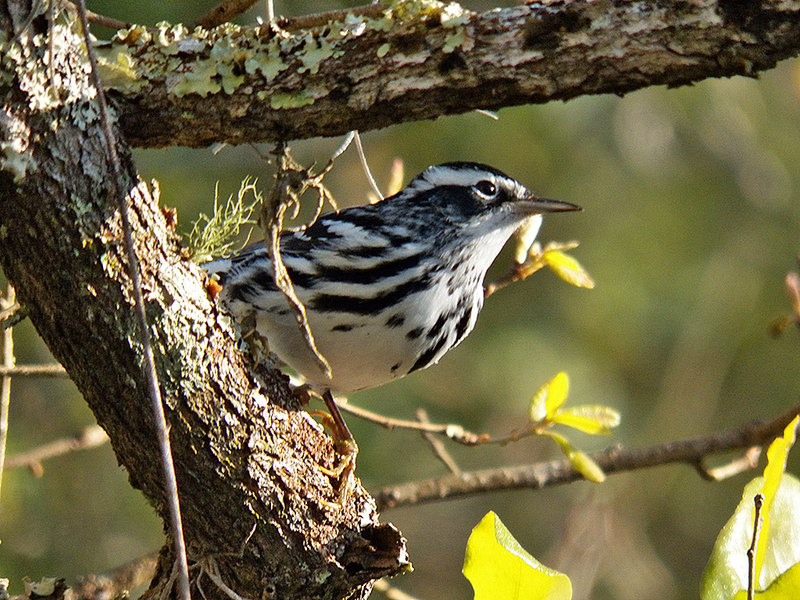 A displeased Black-and-white Warbler glared at me after giving me an earful for playing a bogus song. Yellow-throated Warblers also hang around all year, and the Space Coast is near the southern limit of their breeding range. You can usually find some hanging around during the summer, but they generally stay out of sight. I often find them on the underside of palm fronds, like this, eating insects and spiders. 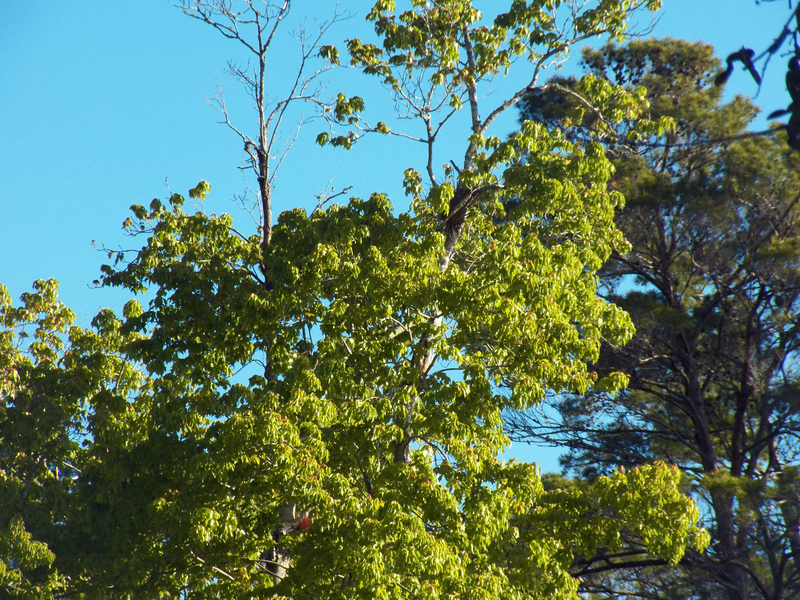 It’s easier to see their brilliant yellow throats when they are up in the canopy. This Yellow-throated Warbler couldn’t hang around long. The Sanctuary was certainly coming alive with the longer days and hopes of warmer weather ahead. Only time will tell how this year’s migration will go, but the amount of activity among the resident birds was perhaps an encouraging sign that the ecosystem is healthy enough to support the migrants, should they stop by this year. I finished the morning with a couple of satisfying things. One was finally confirming to myself that there are American Goldfinches in the Sanctuary (I’ve heard snippets of their calls now and again) by seeing a winter female (I believe). I also noticed some trail maintenance near the canal and Harris radio tower, making access to the weir a little easier. The trail leading from the canoe deck to McKinnon’s Way was also clearer, making access to that area of the park much easier. Much thanks goes to the volunteers for that! Posted on 2015 February 23 2015 February 23 by Lonely BirderPosted in BirdingTagged Birding, birds, Turkey Creek Sanctuary. Next Next post: Kissing Blue-crowned Parakeets!